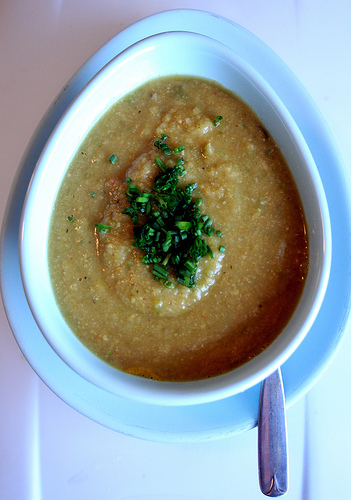 When the weather turns cold, this thick soup is especially delightful. It’s vegetarian- and vegan-friendly, and a favorite lenten dish as well. Add a fish dish like taramosalata, some Greek olives, and lots of crusty bread, and you’ve got a traditional meatless Greek Wednesday, Friday, or Lenten meal (Wednesdays and Fridays are “fasting” days) that’s filling and delicious. For non-“fasting,” serve with a side of sliced feta cheese sprinkled with oregano and drizzled with olive oil. 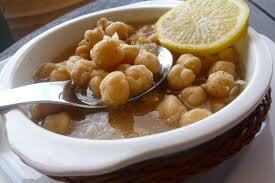 Like other legume and bean dishes, this goes well with salty foods. Note: Getting the thickness that’s to your preference will depend on how much water you use. 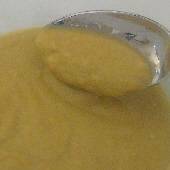 8 cups of water, after pureeing, creates the consistency of a cream soup. If you prefer a thicker soup, start with 7 cups of water. But remember that the soup will thicken as it sits. Day 1: Pour the peas into a colander and rinse with cold water, checking for small stones. Put peas in a large bowl filled with cold water and soak overnight (12 hours). Day 2: Drain peas and rinse. Transfer the peas to a large pot and add oil, bouillon cubes, vegetables, herbs, seasonings and water. Bring to a boil. Note: Foam may rise to the top. This is normal and will disappear as the soup cooks. Allow soup to cool for about 10 minutes. Remove bay leaf and discard. 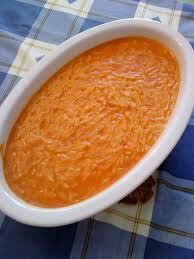 Without: Remove carrots with a slotted spoon, puree the soup, add carrots, and serve. 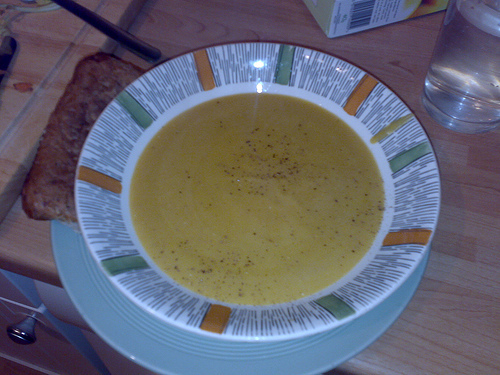 With (photo): Puree carrots with the soup. It will change the color slightly, but still taste great. Note About Soaking Peas: Even when the package indicates that peas do not need to be soaked before cooking, don’t skip the soak for this recipe.